Clare Girton, left, and her 11-year-old, Teddy, in their Wayne, Pa., kitchen. Ms. Girton can check her four kids' assignments and grades by using the district's parent portal. When Debbie Sumner Mahle, an Atlanta mother, wants to know what her sons, ages 6, 7 and 10, are working on in school, she turns on her computer and logs into NetClassroom. The portal lets her see not just their school assignments but also their attendance and grades. More public and private school systems are wiring up data-management systems, and school work is just the tip of the iceberg. Parent-accessible websites and "learning community management systems"—or LCMSs, in the age of no jargon left behind—are increasingly handling schools' scheduling, emergency contacts, immunizations, academic assessments and even meals, with some offering a daily nutritional breakdown of lunch. Molly Baker on Lunch Break looks at the dynamic between parents and school-age children changes now that parents can see homework assignments, grades, and curriculum in real-time by logging onto the computer systems schools are implementing. Ms. Sumner Mahle receives email reminders to place her sons' requests at orderlunches.com, which manages the meal program at their school, the Davis Academy. If she wants to work a shift as a cafeteria monitor, or bring cupcakes to a Halloween party, she signs up at volunteerspot.com. "The sites make volunteering and keeping up on things at school a lot easier. 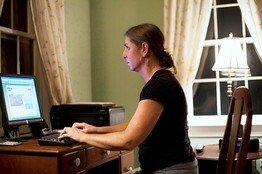 It saves people from the endless chain of emails," Ms. Sumner Mahle says. "But the amount of time you spend online with these things is insane." As districts look to save money by going paperless outside the classroom, the digital push is picking up steam. One immediate result is a new wave of user names and passwords for families to keep track of. Longer term, the change is requiring parents to become active seekers of information, not recipients of mailings or notes sent home from school. And there are opportunities for overuse. More than 100,000 of the country's 125,000-plus elementary and secondary schools rely on some sort of Web presence, says Sanjeev Ahuja of Edline, one of the largest providers of website management and support to schools whose systems include Edline and SchoolFusion. The other systems out there typically have a parent portal with a name like iParent, Homelink or MyBackPack and the offerings can be customized. 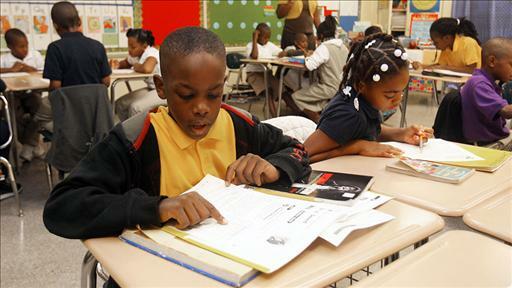 For some parents, the systems are a way to feel more involved in their children's education. This isn't always a good thing for their children. "I find it to be a really good communication tool for me. But it can also be used for evil," says Kammy Hambrick, who uses the Henrico County Public School website, outside Richmond, Va., to track the work of her two sons, ages 12 and 9. "These tools give parents more opportunity to hover, and I was completely guilty." Ms. Hambrick says she was logging in every day to check on homework assignments, grade averages and upcoming tests and projects. "I knew what time individual teachers updated, and I would be on there at 4:01," she says. "It was bad." Clare Girton says she misses the human connection when using the district portal to keep up with happenings at school. This school year, her 12-year-old, Jack, called her on her habit. "He said, 'Mom, you need to stay off my HCPS link. I can do it myself.' And he's right. 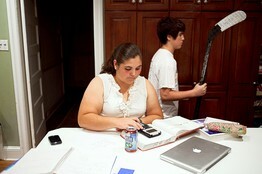 Part of middle school is crashing and burning, and learning how not to crash and burn," she says. The two did agree that Ms. Hambrick would have the right to make random checks. As they get older, though, students often become the ones who hover. 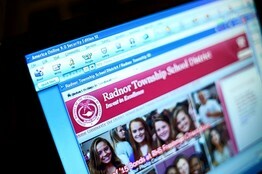 "Sometimes you'll hear in school, 'Oh first period got their tests back,' so then everyone will race to their phone or a computer and check," says Meg Girton, a junior at Radnor High School in Radnor, Pa. "I'm starting to look at colleges and I do care about my grades." Clare Girton, Meg's mother, says in her household, the district's system isn't a seamless communications tool yet. The Girtons' seven-year-old Dell PC sits in the corner of a second-floor bedroom—far from the family command center in the kitchen, where most of the planning and decision-making about the four children takes place. Ms. Girton uses a double-page Month-At-A-Glance paper calendar to keep track of her family's busy back-to-school routine of homework, hockey bags, baseballs and soccer balls, lunches, backpacks and SAT-prep books. "What I don't need is another password," she says. Meg Girton, left, says some of the most avid users are students checking their own grades. "All of these emails come from school and I can never open them because my computer is too old," Ms. Girton says. "If I want to get any information from the high school, I first ask my high-schooler's permission to use her laptop. Then I usually have to ask her to log in for me, because I don't know the family password." Teddy, Ms. Girton's fifth-grader, wants to know if he should pack his lunch or buy. It depends: Are they serving "breakfast for lunch" or veggie lasagna? The monthly menu used to hang on the refrigerator door. Now, it's all online. "He's going to have to take his chances because I can't be checking it all the time," Ms. Girton says. What concerns Ms. Girton and some parents is the sense that community bonds are weakened when the district gets wired up. "Sure it streamlines it, because you don't have to talk to somebody," Ms. Girton says. "But sometimes, isn't that part of it—talking to somebody?" Typically, privacy concerns don't surface as a barrier to acceptance, providers say, possibly because people are now accustomed to having so much of their banking and medical business online. Security and student privacy are a priority, they say, and the systems are continually upgraded. School districts credit these systems for huge savings in paper, mailing and office expenses. Teachers praise their ability to relay the same information to all parents at the same time. "There are parents who are divorced or separated, you've got working parents, or you could have a parent stationed in Iraq. Now they all have access to the same information," says Edline's Mr. Ahuja. "It can make for a much more meaningful conversation with children about school." "Being up on technology is not considered a luxury or an option anymore," says Kristin Hayman, a teacher at the Haverford School in Haverford, Pa. "It used to be just young teachers or the parents who were really advanced who used the systems." For families that lack home Internet access, many districts and schools keep computer-lab hours in the evenings. And many providers offer mobile versions of their portals, so parents can access them using smartphones. "It's about getting parents involved not just at the end of the quarter and at report card time," says Rob Wilson, president of Edupoint, whose biggest product is the Genesis system, which manages student-information systems for more than 200 school districts.